Pest Expert Wasp Nest Powder is a highly effective wasp nest killer suitable for treating inaccessible wasps nests. Pest Expert Wasp Nest Killer Powder is an excellent wasp nest killer. It is perfect for use when you can see where wasps are going in and out but the wasps nest itself is not visible or accessible, e.g. under eaves, between roof tiles, air vents, etc. Containing the wasp killing insecticide permethrin, the powder kills wasps on contact and destroys a nest within 24 hours of treatment through wasps taking the powder into the nest on their legs and wings. Shake well and then puff the powder around obvious entry points where wasps can be seen entering the building. In wet weather a second application may be required. 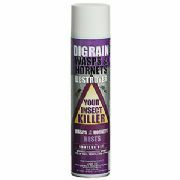 If the nest is visible, then it can be treated with Rentokil Wasp Nest Destroyer Foam or Digrain Wasp & Hornet Nest Destroyer (see related products below).